Donald Larkin Hinshaw1,2,3,4,5,6,7 [Larkin Donald Hinshaw8]. Henshaw, Donald L., lodger, age 21, born in Ohio; parents born in Ohio; single; occupation: [..unclear..] R.R. Hinshaw, Donald L., head-of-household, age 32, born in Ohio; parents born in Ohio; first married at age 31; owned home ($2000 value); radio in home; occupation: brakeman, steam road; not a war veteran. 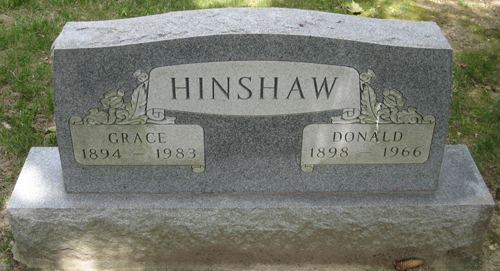 Hinshaw, Ida G., wife, age 35, born in Indiana; parents born in Indiana; first married at age 34. Humbert, Mary K., mother-in-law, age 66, born in Indiana; father born in Ohio; mother born in Pennsylvania; widow; first married at age 19 [unclear]. Information from Ginger-lyn's cousin, Jane Walls Wilson. 1920 census, 3rd Ward, Huntington, Huntington County, Indiana; roll T625-437, ED 112, page 5A, line #38, dwelling #119, family #125. 1930 census, 4th Ward, Huntington, Huntington County, Indiana; roll T626-593, ED 8, page 5A, line #46, dwelling #105, family #106. 1900 census, 2nd Ward, Huntington, Huntington County, Indiana; roll T623-378, ED 80, page 25A, line #13, dwelling #592, family #609. 1910 census, 4th Ward, Huntington, Huntington County, Indiana; roll T624-356, ED 94, page 2B, line #51, dwelling #38, family #38. 1920 census, 4th Ward, Huntington, Huntington County, Indiana; roll T625-437, ED 115, page 10A, line #47, dwelling #213, family #225.